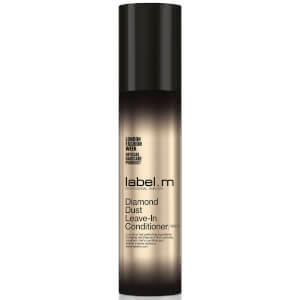 Infuse hair with shimmer and shine with label.m Diamond Dust Leave in Conditioner, a lightweight spray crème that smooths and protects. The brand’s exclusive Micro-Diamond Complex contains a luxurious blend of Pearl Dust, Champagne, White Rose Petal Oil and White and Black Diamonds which have been pulverised to easily penetrate the hair shaft. The treatment helps to soften strands to improve manageability, whilst Coconut Oil replenishes vital moisture from root to tip. Hair will be silky, hydrated and glowing with health. Apply evenly to mid-lengths and ends, leave in and blow-dry to achieve a smooth glowing shimmering finish adding a layer of protection.